The super low price of the Kiwi doesn't mean that Ashford have compromised build quality. The design is lightweight, portable but sturdy. The frame is solid New Zealand Silver Beech, the drivewheel from medium density fiberboard (MDF). 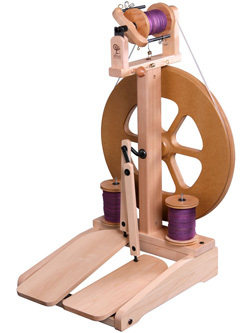 You even get a double treadle, which makes treadling easier and it's possible to stop and start the wheel with your feet. The flyer is positioned centrally, right over the wheel, which makes it comfortable to use for either right-handed or left-handed spinners. With the new Kiwi 2 you get a sliding hook flyer and the new larger 90mm bobbins. Single drive, natural finish : £295 now out of stock what's going on?